Matt Dillon wasn't always taken as seriously as he is today. It wasn't until "The Flamingo Kid" (1984) that critics began to consider that the teen star might actually have potential as an important screen actor. That promise was fulfilled in the minds of many with his performance in "Drugstore Cowboy" (1989). For that performance, he won an Independent Spirit Award. 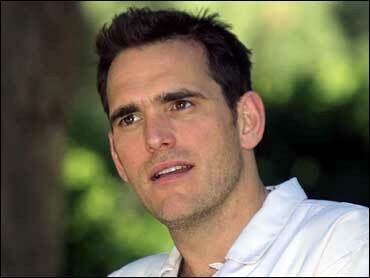 See photo essay for more pictures of Matt Dillon. See Oscar Scorecard to see how Dillon is doing compared to the other nominated actors. Watch video to see Dillon's reaction to his Golden Globe nomination. He proved himself more than capable of handling a comic role as Ben Stiller's lowlife rival for the attentions of Cameron Diaz in "There's Something About Mary." (In real life, Dillon and Diaz were an item for a few years.) But even before "Crash," the 42-year-old actor illustrated a knack for ensemble work in such movies as "To Die For" (1995) and "In & Out" (1997). Dillon was reared in a large Catholic family, along with a sister and four brothers, one of whom is the actor Kevin Dillon. He's never been wed but in his next movie, "You, Me and Dupree," he plays a newlywed married to Kate Hudson.